Scientists have discovered something amazing. Holder called this eccentric pair of gravitationally linked stars a "gamma-ray binary system" and likened the once-in-a-lifetime event to the arrival of Halley's comet or last year's U.S. solar eclipse. Even fewer—only two systems, including this one—are known to have an identified neutron star, or pulsar, that emits pulses of radio waves that scientists can measure. This is important because it tells astronomers very accurately how much energy is available to accelerate particles, something scientists know little about. "You couldn't ask for a better natural laboratory to study particle acceleration in a continually changing environment - at energies far beyond anything we can produce on the Earth," said Holder, a professor in UD's Department of Physics and Astronomy. "Because our galaxy is full of them. We call them cosmic rays and they carry as much energy as the light from all the stars," said Holder. Astronomers discovered more than 100 years ago that accelerated particles exist, yet how or where these particles speed up remains a mystery. Pulsars are among the most extreme objects in the universe and they have magnetic fields around them that are millions of times stronger than anything scientists could hope to build on earth. When a pulsar encounters dust or gas close to a massive star, the particles nearby accelerate—to near speed of light velocities—and collide with what's around them. The result is a beam of high-energy light called gamma-radiation or gamma rays. 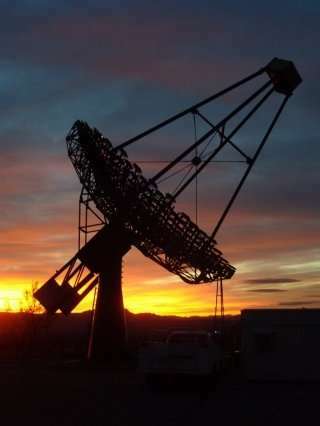 Sophisticated telescopes, like those operated by VERITAS and MAGIC, can detect these gamma rays because they emit a blue flash of light when they reach the Earth's atmosphere. While our eyes can't see these flashes of light because they are too quick, only nanoseconds long, these telescopes can. By measuring these radio pulse frequencies, astronomers were able to tell how fast the pulsar was moving and calculate exactly when it would be closest to the massive star that it was orbiting—Nov. 13, 2017. It's a trip that took 50 years. The VERITAS and MAGIC teams began monitoring the night sky and tracking the pulsar's orbit in September 2016. At first, they weren't even sure if they would see anything. But in September 2017 the astronomers began to detect a rapid increase in the number of gamma rays hitting the top of the earth's atmosphere. 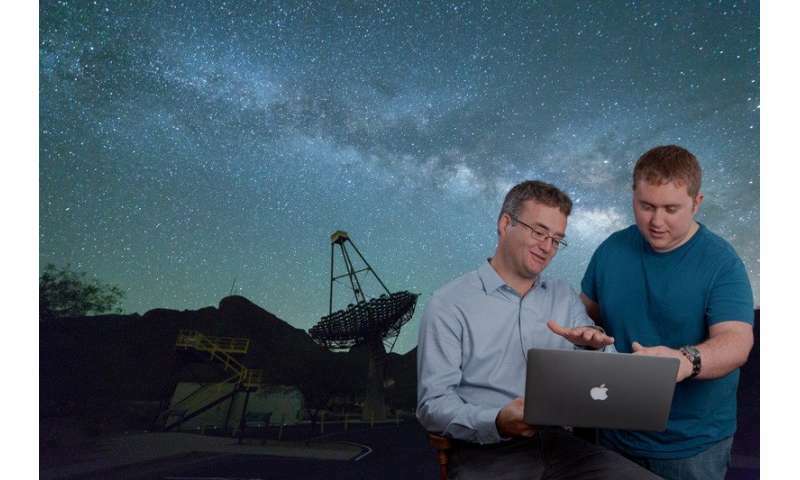 "I would wake up every morning and check and see if we had new data, then analyze it as fast as I could, because there were times where the number of gamma rays we were seeing was changing rapidly over a day or two," said Williamson, a fourth-year doctoral student. During the closest approach between the star and the pulsar in November 2017, Williamson noticed that the VERITAS telescopes had—overnight—recorded ten times the number of gamma rays detected only a few days before. "I double checked everything before sending the data to our collaborators," Williamson said. "Then one of our partners, Ralph Bird at UCLA, confirmed he'd gotten the same results; that was exciting." Even more interesting—this observational data did not match what predictive models had predicted. 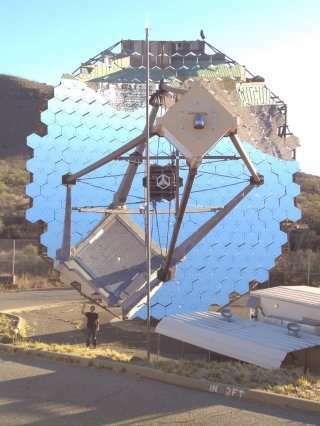 "But our recorded data showed a huge spike in the number of gamma rays instead," Holder said. "This tells us that we need to revise the models of how this particle acceleration is happening." 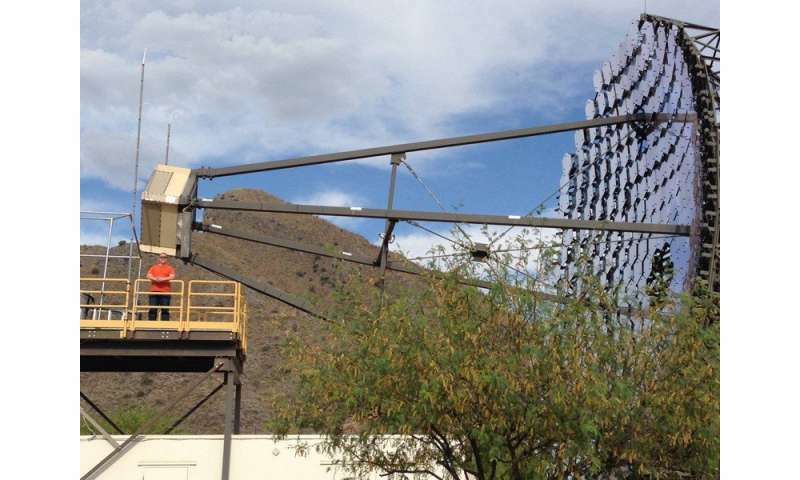 What's more, according to Holder, while astrophysicists expected the National Aeronautics and Space Administration's (NASA) Fermi gamma-ray space telescope to record these gamma rays, it didn't. Holder said the reason for this is unclear, but that is part of what makes the VERITAS results so interesting. Astrophysicists want to learn just which particles are being accelerated, and what processes are pushing them up to these extreme speeds, in order to understand more about the Universe. Holder said that although gamma-ray binary systems probably don't accelerate a large portion of the particles in our galaxy, they allow scientists to study the type of acceleration mechanisms which could produce them. Astronomers won't be able to see this binary system at work again until 2067 when the two stars are once again close together. By then, Williamson joked that he just might be an emeritus professor with time on his hands. At the moment, Williamson is not worried about running out of things to do. He spent three months at the Arizona-based observatory earlier this year, taking measurements, performing hardware maintenance and devising a remote control to allow the researchers to turn on the telescope's cameras from a computer inside a control room. "It was a great chance to spend hands-on time with the telescopes and get to know the instrument," said Williamson. Going forward, he'll spend the remainder of his doctoral studies combing through and analyzing in greater detail the nearly 175 hours of data the VERITAS telescopes collected in 2016 and 2017. "Tyler is, without a doubt, the luckiest graduate student I've ever met because this event that happens only once every 50 years—one of the most exciting things we've seen with our telescopes in a decade—occurred right in the middle of his doctoral work," said Holder. How fast is the pulsar rotating? "Rapid increase in gamma rays." How rapid? "How fast it was moving." OK....how fast WAS it moving? These and other statements should have more information. An article that makes repeated references to the speed of something, SHOULD include what the speeds are. Too many articles are so vague that they take a topic that could be very interesting, and turn it into a waste of time to read. The articles here at phys.org are supposed to be about science, and if you have the numbers, then include them. Dumbing it down like this is a sure way to encourage a lot of people to go elsewhere to read science articles. Henry, at the bottom of the article are listed several sources for the information you seek. Why does phys.org accept these articles as written? This site is all about the advertising. Pays the bills & the salaries. They accept so many click-bait headlines to get paid from their advertisers by the count of eyeballs om the page. As do most other internet sites. It's a business and every successful business concentrates on the ROI. These articles as offered, are many times, if not every time, popularized science. To attract those profitable eyeballs of the general populace and those with some interest in the subjects posted. Many of these articles are written by students. Especially the translated articles. Not always Science Majors. But then, even English Majors students need to earn some pin money. If you are dissatisfied with this explanation? If you would prefer a more in-depth material? Subscribe to the professional journals listed below the article. @HenryE that should answer all your questions. "The articles here at phys.org are supposed to be about science, and if you have the numbers, then include them." "These articles as offered, are many times, if not every time, popularized science. To attract those profitable eyeballs of the general populace and those with some interest in the subjects posted. Many of these articles are written by students." Typically these articles are university press releases that the researchers make to fulfill grant conditions and/or in general try to attract interest and understanding for the research. (Which is a win-win for universities/researchers - grants - and public - science info.) The tip off is when there is a University listed in the byline; if there is also a name it is the university press officer and you can rely on her not knowing the research but has helped the researchers formulate the text. If an anonymous text originates with the research group, it is often the lead author - the expert - that does the most whether or not the "student" label fits as here ("in the middle of the doctoral work"). The absence of numbers is because they are advised they get fewer readers that way (though personally I would like to see them anyway); always go to the source paper since you need at least browse it to grok the specifics. At best the press release can fill in some context and simplify the generals, at worst they confuse. YMMV. Thank you for your responses, you have all made good points regarding this. Time is unfortunately a factor, and while I do followup on some articles to glean more information, there simply isn't enough time to dig out all the facts regarding every interesting article. Information that is basic to the article should be included -- when something increases rapidly, does it double in an hour? A minute? Is a month rapid in this context? And for something like Pulsars, whose distinguishing feature is normally the rate of rotation, that information should be part of any article about a particular Pulsar. @Henry, there is a button on the right for you to share feedback with the editors. This is probably good feedback, but this particular article was written by a publicist at a university so it's unlikely to make a difference. I would recommend you wait for an article written here, see if this sort of information is missing, and provide feedback if it is.